The inscribed text is a compilation by Emperor Qianlong of different verses taken from ancient Classics in praise of the Three Star Gods: Fu Xing, Lu Xing and Shou Xing. On this plaque and in the poem, the Three Star Gods of Daoism form the main subject-matter: Shou Xing (Shou Lao), Fu Xing and Lu Xing, representing longevity, happiness and emolument respectively. Each deity is shown with his own attribute, which are also auspicious symbols in their own right. Shou Lao, the oldest of the three Star Gods, is characteristically shown with a staff and a peach of longevity (or a platter in this case). Fu Xing is usually depicted surrounded by little boys and Lu Xing, holding a scroll of law. 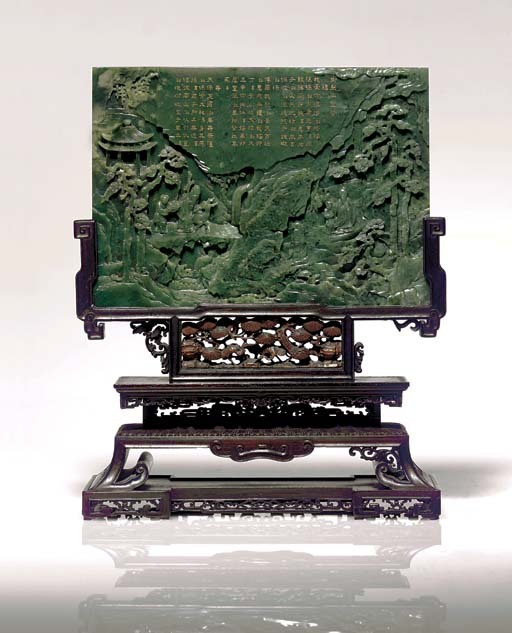 The intricate style and quality of the carving of this screen is comparable to that on a spinach jade brushpot, also from the Hartman Collection, illustrated by Robert Kleiner, op. cit., no. 113. The screen was clearly carved to accommodate a particular poem, as the inscription occupies an especially large area. The wood stand is of very high quality and was probably made for the piece. It is very likely that the stand comes from a matched series as it is very similar to another stand supporting a circular spinach jade table screen; cf. Roger Keverne (ed. ), Jade, London, 1991, p. 183, fig. 138.